Sierra College was one of only eight colleges statewide selected to focus on the Advanced Manufacturing sector by the California Community College Chancellor’s Office Division of Workforce & Economic Development. With a $300,000 grant, Sierra College will collaborate with community colleges in the Sacramento region to fill gaps in manufacturing workforce skills, provide employee training customized to manufacturers, and inspire students to pursue Advanced Manufacturing careers. Advanced Manufacturing uses innovation, automation and highly integrated, tightly controlled processes as well as new materials and capabilities to fabricate products competitively. Carol Pepper-Kittredge, Director, Sierra College CACT, will be the Deputy Sector Navigator for this grant project. “There are excellent opportunities for high-wage jobs in Advanced Manufacturing in our region,” said Pepper-Kittredge. In response to the explosive growth of 3D Printing, Sierra College Center for Applied Competitive Technologies (CACT) published a white paper identifying trends, outlining uses and providing a review of Additive Manufacturing equipment for business and education. Additive Manufacturing is the ability to generate three-dimensional models that need no machining or tooling. In the 3D printer, layer by layer of material builds up until the desired shape is achieved, instead of cutting away material as is done in machining. Computer 3D drawings are sliced into layers and the software directs the printer pattern as it builds the part from the bottom up. Products can be designed in Computer Aided Drafting (CAD) software or 3D scanners can be used to create designs from existing objects. The Additive Manufacturing Turning Mind into Matter — Industry Evaluation and Recommendations Report is intended to help both businesses and educators learn more about emerging Additive Manufacturing technologies and can be found at the Sierra College CACT Training website. California Community Colleges across the state offer innovative industry-based training to prepare students for excellent careers. Below is an example of the CNC Machining program at De Anza College. 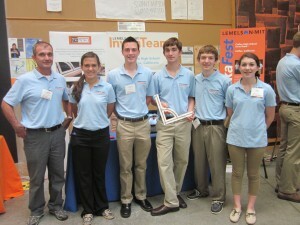 Colfax High School students, with a support of MIT, invented the Tri-Metric. It is a tool that offers a brand new way to layout a house. The mechanical device sits in the middle of the building envelope and uses similar shapes to make sure the floor, walls and roof are all square to maximize support. This tool can be used by any home builder, but is especially designed for emergency relief housing constructed by Mercy Corps. It can be manufactured for under $20 and because all the complex math of trigonometry is built into this inventive tool, it can be used by the novice, expert or anyone in between. Watch the amazing progress of these high school STEM students applying academics and using critical thinking throughout the design process. Twenty-three movies are available on the ColfaxMath channel under Colfax Inventeams Tri-Metric. For example, watch the evolution from prototype to products on Twenty Little Bets to make the Tri-Metric. See how to Learn Trig the easy way with the Tri-Metric. Find out how to use the Tri Metric, Construction Layout Tool.